PHILADELPHIA >> It’s being promoted as the most comprehensive exhibition of Mexican modernism in the U.S. in more than seven decades. This enlightening presentation of Mexican culture — which includes works by Diego Rivera, Frida Kahlo and about 70 other artists — is comprised of portable murals, large and small paintings, prints, photographs, books, broadsheets and even wall-size interactive digital video of large site-specific mural cycles by Rivera, José Clemente Orozco and David Alfaro Siqueiros. There are references to the Teotihuacan pyramids, Mexico’s volcanoes and mountains, the agrarian revolutionary Zapata, Catholicism, the cubists, the surrealists, and a distinct Mexicanidad national identity that’s part Spanish and part indigenous Mesoamerican peoples. The 40-year span represented in “Paint the Revolution” was full of political upheaval and social change south of the border. A civil war raged from 1910-1920, for example. The exhibit has five chronological chapters offering a historical narrative, from the bloodbath of the war, to a rise in nationalistic public visual arts during the reconstruction, to the cosmopolitan avant-garde art movement, to alarm over the rise of fascism in Europe and its influence on the Spanish Civil War, to the post-World War II modernization of Mexico. “Paint the Revolution” ends where it does, according to Renato González Mello, Director of the Institute for Aesthetic Investigation at the National Autonomous University of Mexico, because in the 1950s less-ideological abstract painting ruled Mexican modernist art. “Because of a new Mexican prosperity, in the ‘50s things changed,” he said. A “Paint the USA” section looks at America’s influence on Mexican art. Starting in the late ‘20s, universities and art patrons started awarding mural commissions to Mexican painters because they admired the social consciousness of their work. The exhibit gets its title from an essay called “Paint the Revolution” by American novelist John Dos Passos, who traveled to Mexico City in 1926-27 and witnessed Rivera’s murals that celebrated the ideals of the Mexican Revolution. Alfredo Ramos Martinez made tempera paintings on pages of “The Los Angeles Times.” Orozco moved to New York in 1927 and stayed in the U.S. for seven years. 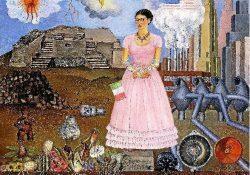 Rivera crisscrossed the country with Kahlo from late 1930 through 1933. One of the many arresting images in “Paint the Revolution” is Kahlo’s “Self-Portrait on the Border Line between Mexico and the United States.” Siqueiros, whose political and artistic activities kept him on the move across North and South America, was in L.A. in 1932 and then spent time in New York in 1934 and 1936, where he founded the Siqueiros Experimental Workshop, a studio for the investigation of new painting techniques. Check out his large 1936 oil painting depicting George Gershwin in concert at the New York Metropolitan Opera House. Where: The first floor Dorrance Special Exhibition Galleries at the Philadelphia Museum of Art, 2600 Benjamin Franklin Parkway, Philadelphia. Hours: 10 a.m. to 5 p.m. Tuesdays through Sundays, till 8:45 p.m. Wednesdays and Fridays (closed Thanksgiving and Christmas). Admission: $20, $18 for seniors 65+, $14 for students and youths 13-18, free to children 12 and under and members, pay-what-you-wish the first Sunday of the month and Wednesdays after 5 p.m. Info. : Call (215) 763-8100 or visit philamuseum.org. Facebook and Twitter: @philamuseum; Tumblr: @philamuseum; YouTube: @PhilaArtMuseum; Instagram: @philamuseum.